Lots of knitting going on, unfortunately I always forget to get finished pictures of completed knits. 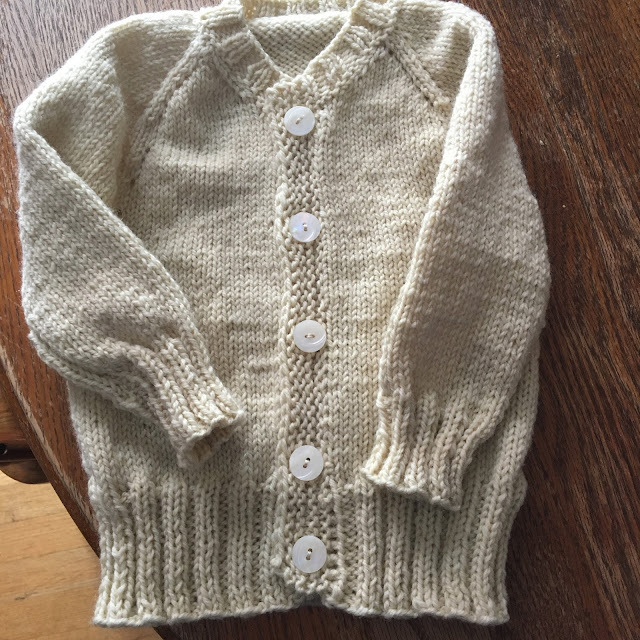 I’m talking about the vest (Shoreline Vest), I knitted for my youngest. Let me just say she was pleased with the vest and sported it all day…it looked great on her!!!! Also, moved to the finished list, is a pair of overalls for No fuss Gus. They turned out great!, and much needed for the Women's March we all attended in Cheyenne. Let me just say the March was great and it was COLD, COLD! I am moving forward with my EZ Guernsey sweater but have concerns. It looks big, too big. Will recheck my math and compare sweater to an already knit sweater. Any other suggestions will be gladly welcomed and appreciated. Somehow in all the activity of the past week, I completed a book! The Longmire series is one of my favs. Always interesting with twists, turns and a shocking end, now the wait begins for his next book. Amazingly, I have five days with no young kids and I plan to sew! I have on the docket, little pants, hopefully a dress for me and borders to complete a quilt. A little hand quilting will be thrown in the mix for a well rounded weekend. My youngest ( here from Minnesota last week, she is one amazing lady and so good to see her), husband and I went to the movies. I am not a theater fan, love movies just not theaters. We saw the POST and it is well worth the time and money. 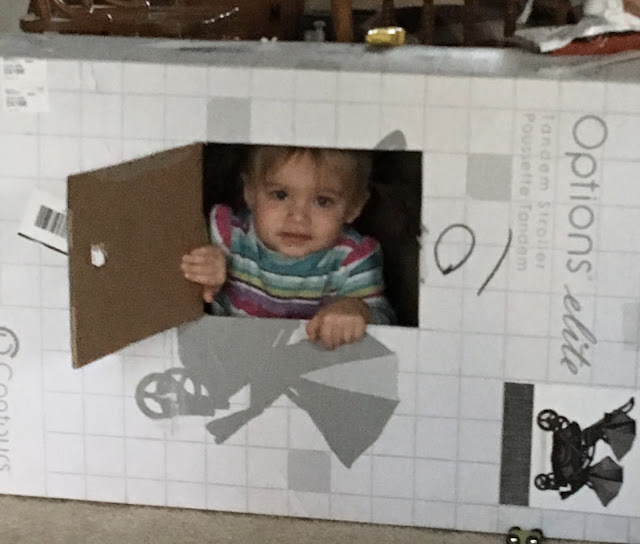 I must admit, more money was spent on Little IKes ( I think thats what they are called) and popcorn than any adults should eat in one sitting. The show stopping line in the movie for me :The press was to serve the governed, not the governors. I spent the weekend on the couch reading Fire and Fury..... WOW! Frighting, boils my blood, some great laughs and exhausting! Let me just say: 'it's worse than I ever thought.' I realize this author does not have the best reputation, but so much in the book has already been reported on by both the papers, the news stations and was information I already knew. It's the chaos that got to me! I can say :'I am so grateful for the 3 generals that work closely with the White House.' And Bannon-one scary dude! Now on to real life- my day today is filled with getting the house into better shape, ( only willing to spend a couple of hours in this category), then on to quilting and knitting, (depending what I am watching and need for my brain to be working). 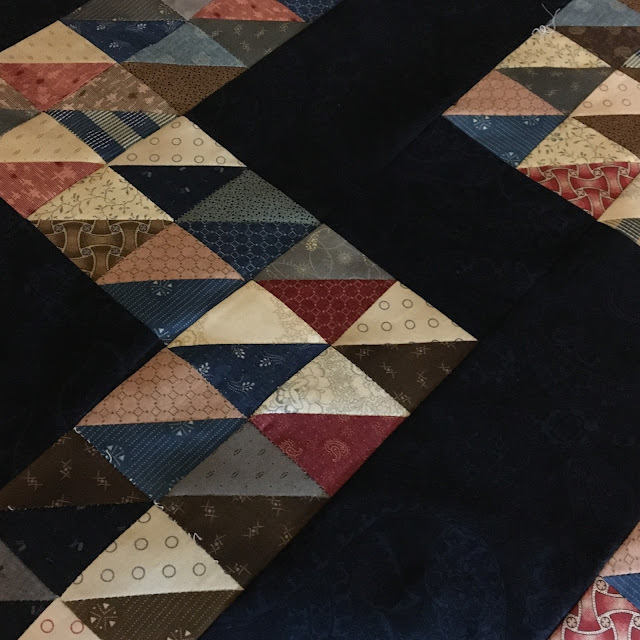 I am loving getting back into hand quilting, it has been so long since I have hand quilted, I forgot how soothing this slow process is to my mind. A couple of hours a week that can add up to about 10 hours total weekly, gets a lot done. My Elizabeth Zimmerman sweater is my current challenge. Trusting my math skills, re-knitting the same row no less that 7, yes, SEVEN times normally would have sent this project to the round bin. In all my being this was war! and I intended to win! I ended changing my stitches reducing by 2 stitches and using only half of the graft pattern in the instructions guide, then making up a pattern to fit it all together...whew! You know...it worked! In the round knitting has commenced. We had the Grand kids for a day and it went off great! Walked up to a small pizza parlor for lunch then doughnuts for dessert at home. Little B insisted on caring the bag home...so cute! Yes, I am playing around with text this month! Hello Yarn Along, how I have missed you! Thank you Ginny, for bringing back a favorite group for sharing and meeting other people who like to read and knit! Reading: Cold Hearted River by Keith McCafferty. It’s a murder mystery involving a fly fishing guide in West Yellowstone Montana. I got hooked on this author while camping in YSNP and this guy can’t write books fast enough for me. Listening to: Prairie Fire. This book was on the top ten in the New York Times paper. I'm not sure I like it. The author spends a lot of time blaming the Ingalls, (Little House on the Prairie) for many of the problems caused by the west ward expansion. I believe those problems, and their were many, were caused by the US Government horrible treatment of the American Indians, not because the Ingall's family. Knitting: Elizabeth Zimmerman’s Guernsey sweater using the EPS. It is a challenge, having to trust my math and measurements, oh dear. I am at the arm gussets and have had to refer to two books on how to do these gussets. I wanted a challenge and now I have one. Looking forward to see what everyone else is reading and knitting…oh happy day, what a great way to start off the New Year! We have been enjoying a very slow quiet Holiday week. I put together a 2018 list of UFO's I want to complete with a small list of projects ( knitting and quilting) I would like to start. This list at first was long and impressive, though not reasonable. I reworked the list to appropriate achievable goals, why set up a situation only to fail before the month of January turns to February. One project I am excited to be working on again is the Amish quilt I started years ago. I forgot how much I enjoy hand quilting, even though truth be told, I have to use a larger needle with a bigger eye. Aging, something not worth fighting, but worth learning how to work around changing physical needs. Finished Betty's sweater to match the sweater I made Caitlin for Christmas. They were here for New Years eve dinner of White Bean Chicken soup, ( it was amazing ), and Mom/Daughter, when time to leave walked out of the house in matching sweaters. 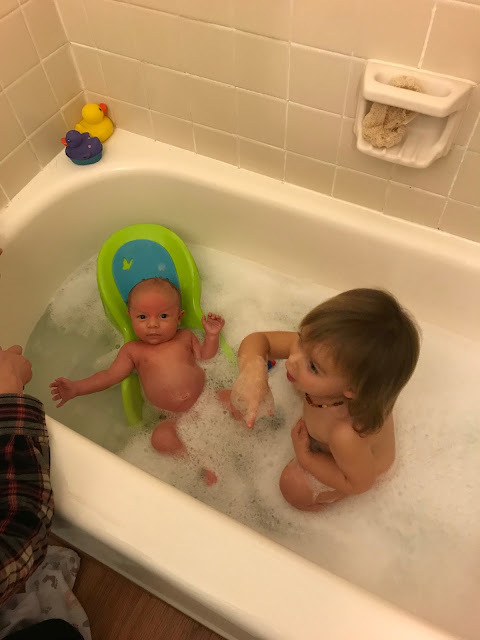 I know, why didn't I get a picture, oh yeah, getting a one month old and 19 month old out the door and all buckled into car seats is no small job, even with four adults! It's been cold and windy here! Hard to complain when my daughter Erin in Minneapolis is experiencing -20 degrees and frozen pipes! She had no water on New Years day, but lots of quilts and a line up of movies to watch! That's my girl! I completed the scrap quilt top above to the pattern instructions and yet, it doesn't feel complete to me. Borders, at three to four borders are calling to me for this quilt. 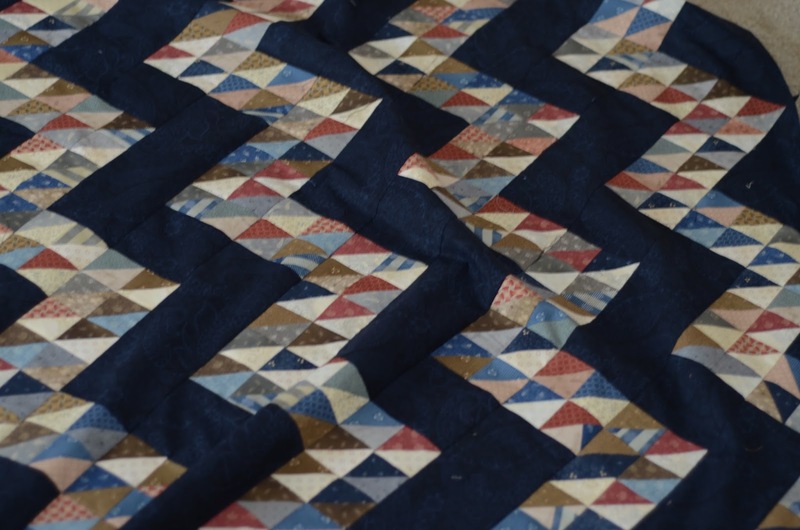 Half square triangles, two rows with two rows of the dark blue print, this is what I worked out in my head last night before sleep! Happy New Year!! What plans do you have for 2018?